The Chief of Army Staff, Lt.-Gen. Tukur Buratai has charged field commanders to complement whatever approach they take in prosecuting the ongoing counter insurgency operations with offensive posture. Buratai gave charge on Friday in Maiduguri at the conclusion of the Fourth Quarter Chief of Army Conference. He said such posture was necessary to instill fear in the terrorists. 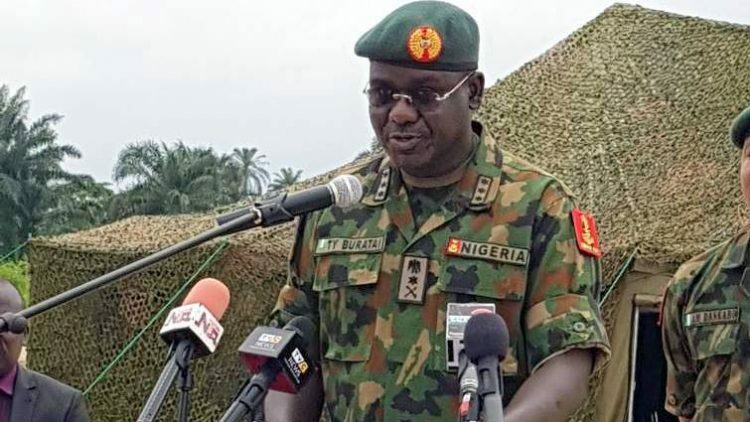 Buratai warned troops not to be deterred by the recent setbacks, especially at Metele, where the Boko Haram terrorists attacked troops of157 Task Force Battalion, killed 23 of them and wounded 31 other others. â€œOperational commanders at all levels must show leadership and inculcate such virtue in subordinate commanders. â€œThe recent unfortunate incidences involving our troops have given me great concern and should concern all of us. â€œWe have not focus on providing adequate force protection and our offensive posture has been below expectation,â€™â€™ the army chief said. According to him, the development of `super campsâ€™ and more emphasis on functioning logistics bases will give us a more deliberate approach to achieving force protection and reducing our delivery of needed logistics to units in the field. He expressed satisfaction that the objectives of the three-day conference had been achieved without giving details, but charged commanders to ensure that decisions reaced were implemented. The army chief used the opportunity to restate that the army would remain apolitical and non-partisan in the conduct of the 2019 general elections. â€œYou are all expected to deal decisively with any individual or groups, who may attempt to disrupt the 2019 general elections in line with our extant laws and rules of engagement,â€™â€™ he said. Buratai also said that in joint operations with non-military security agencies, field ranks must be given to deserving Senior Non-Commission Officers â€“ SNCOs. According to him, this is to ensure proper command and control in all operations where the army participates.